During mid-July, 2013, the General Directorate of Antiquities and Museums (DGAM) of the Ministry of Culture in Damascus received an urgent message from citizens of Berhalia, a village about 30 kilometers West of Damascus. Berhalia is located in an area that has seen much fighting and from which the central government has lacked easy access and no control. The simple message was that it might be possible to recover a severely damaged Syria archeological treasure from rebels who took possession of it. The piles of thousands of small colored Byzantium tiles called tesserae, according to someone involved in the case, were initially impossible to identify because the archeological context had been substantially demolished as had the building which housed the antiquity. The mosaic chips were discovered to depict elaborate scenes from deep in Syrian history and once finally able to be measured it was determined that the mosaic had been approximately 60 square meters in size. The antiquity is decorated with geometrical ornaments and consists of two rectangular panels, one being an orthogonal pattern of perpendicular intersecting tangent four- pointed star, forming lozenges alternately recumbent and upright. The second, which was only partially conserved, is decorated with a large star of two interlaced squares inscribed in a circle. The heaps of terrerae predated the second half of the 4th century, according to D. Komait Abdallah, Director of DGAM's scientific laboratories located in the Damascus Citadel. The massive Citadel was first fortified in 1076 by the Turkman warlord Atsiz bin Uvak and is part of the Old City of Damascus, which was listed as a UNESCO World Heritage Site in 1979. Eventually, a local citizen of Berhalia, who had apparently been a former rebel sympathizer of some sort and who had been a student of an archeologist at Damascus University, took an interest in the mosaic which was not far from his home, which his family had fled months earlier. Contact was then made with Syrian army units in the area and a meeting took place between a delegation of local citizens and some of the rebel militiamen, who some of them had known before the crisis erupted. It was the latter who had possession of the small pieces of the at least fifteen century old irreplaceable Mosaic. The citizens, like so many Syrians this observers has met over the past few years, feel deeply connected with Patrimoine Syrien. They pled their case to fighters on both sides of the current conflict. They beseeched them to put their beloved Syria first and urged that their country's cultural heritage be spared the ravages of war and that the destruction of archeological sites stop. An eyewitness reported that the hardened fighters appeared somehow moved the unusual spectacle. Soon a delegation of specialists in Mosaic and artifacts preservation left Damascus for Berhalia village to investigate. Some locals hint that an envelope may have changed hands containing approximately one million Syrian pounds ($ 1,200 USD). But not wanting to encourage even more entrepreneurs getting rich quick by selling Syria's history, no one is admitting a role in buying or selling Syria's history-even on such a relatively small scale. Others take more of an attitude of "who really cares much, one way or another, given the continuing maelstrom here, as long as a part of Syrian cultural heritage remains under its citizen's protective care?" This expressed attitude has been heard a few times by this observer from the Syrian public who desperately want an end the violence and the soonest possible return to normal life. Almost immediately, more than one thousand pounds of inch by inch Mosiac chips (tesserae) were brought by a military-style vehicle to Damascus for safe keeping. 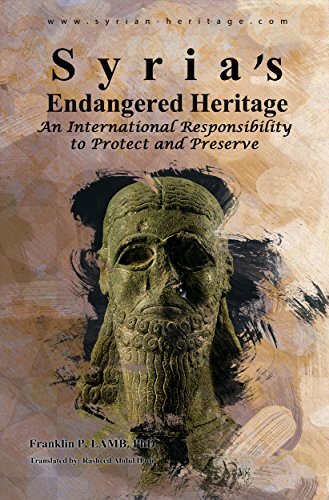 It was around this time that the Director of Antiquities and Museums (DGAM), Professor Maamoun Abdulkarim, and some colleagues made it their personal mission not just to preserve but also to restore the ancient irreplaceable antiquity. The tesserae were then moved to the antiquities restoration laboratory in the midlevel fortified palace known as the Ancient Citadel of Damascus. The mosaic of Berhalia is one of several of the rare mosaics discovered in the Damascus region and is today being restored by a team of 15 students under the tutelage of Syrian Directorate of Archaeological Scientific and Reconstructive Laboratories, and specifically, Instructors Mouhamed Kayd and Borhan Al Zarra. When their work is completed the restored mosaic will be exhibited in the Damascus citadel, first fortified in 1076 by the Turkman warlord Atsiz bin Uvak and which is part of the Ancient City of Damascus, which was listed as a UNESCO World Heritage Site in 1979. In the course of visiting damaged archeological sites in Syria, this observer spent time with this remarkable and skilled team of artifact restoration students. As four of the students took a break from their work one day, and offered their guest tea and a local pastry, I felt comfortable posing a few questions that they quite spontaneously answered. Fortunately, I had the needed assistance of a brilliant Damascus University student of Arabic and English Translation and Interpretation, named Nuhad. She is from a village near Homs but spends her time these days in Damascus due to many security problems in her area. Below are excerpts from our conversation with names changed at the student's request. Q: How does it make you feel, as you go about this work you are doing, knowing there are people in Syria committing atrocities of the sort seen in some of the videos that have been uploaded to You Tube? Are you afraid? Do you worry about getting kidnapped? Hanan, a twenties something student of pharmacology from Latakia who since last winter has volunteered to work on restoring or repairing whatever she was judged competent to do, answered first.